Size: 1,500 sq. ft. "m/l including Florida Room"
LARGE 2/2 1979 SKYL in Buccaneer Estates. This community is 10 miles from the Gulf Coast and close to the best of what SWFL has to offer. Fun is to be had on the nearby beaches of Fort Myers Beach, Sanibel, and Captiva or in the beautiful, friendly gated Buccaneer Estates. Buccaneer Estates has 2 heated swimming pools, a hot tub, clubhouse, sauna, two exercise rooms, putting green, shuffleboard, hospitality house, billiards, horseshoes and multiple lakes for your enjoyment. This completely furnished unit has over 1,500 square feet including the Florida room. NEW carpet in 2017, NEW bathroom floor, NEW toilets, NEW roof in 2017, NEW fridge, and NEW TV. Your new address is 525 Avanti Way - North Fort Myers FL. Let's make your dream of living in Florida a reality. 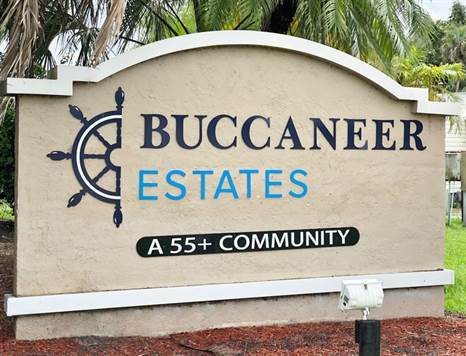 Buccaneer Estates is a 55+ Community but allows 40+. Buyer/s must be park approved.